I woke up just in time to see the entire city sparkling as the bus made its way around the rigid bends of the steep cliff. The view reminded me of an exquisite oil painting, much like the ones where the painter manages to capture the emotion of the city through exaggerated brush strokes. The water glistened from the city lights and although it was nighttime, the contrast of the sky magnified the colors of the distant villas. This was better than any painting or photograph I had ever seen and I had to blink a few times to make sure it was real. I’ll always look back on my trip to the Amalfi Coast as one of the most culturally-enriching experiences of my life that I wish I could relive. The excursion was my first weekend getaway upon arriving in Florence, my new home for the semester. When I decided to go abroad during my junior year, it was one of those spontaneous decisions. As much as I loved college, I wanted something more. None of my close friends were going, so I knew I’d be taking Europe head-on, challenging my own comfort zone every step of the way. Luckily I got grouped with seven amazing girls who I’ll always share a special bond with. I was told that the people you travel with when you’re abroad become your second family… and I couldn’t agree more. It still amazes me how the Blue Grotto never made it to the list of the Seven Wonders of the World. 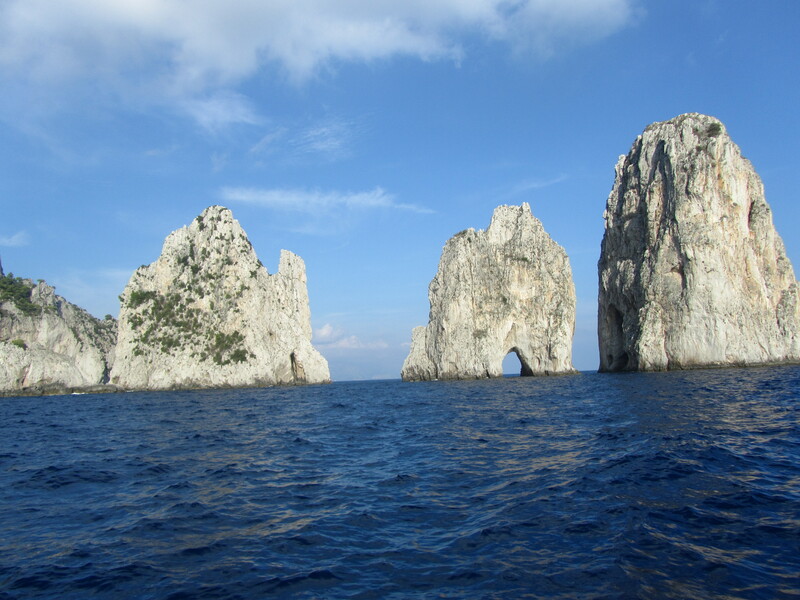 On our first morning we departed from Sorrento, with a daytrip to Capri as our final destination. When our boat docked alongside of a cave with tiny wooden canoes circling around it, I had no idea what to expect. We wobbled from one boat into the next as we approached a carved out opening. The passageway into the grotto is so small, that passengers are instructed to lie back as the boatman enters the cavern. Once inside, the cave unveils an illuminating blue sea that blends from a deep tanzanite perimeter to a glowing aquamarine core. The sensational colors radiate from two holes – the cave’s opening and an underwater hole – to create the illumination. We circled the inside for just a few moments as the boatman serenaded us in a heavy Italian dialect. Although I tried, pictures don’t do justice in conveying the beauty. 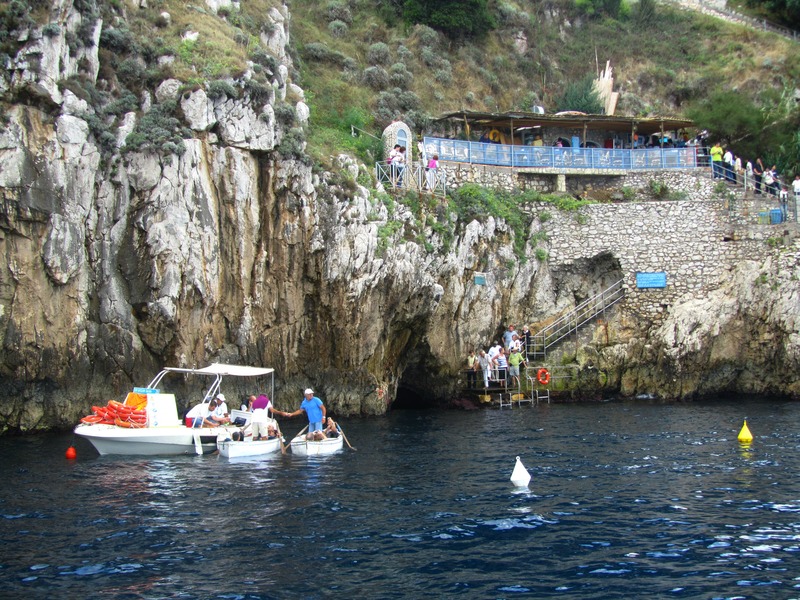 The Blue Grotto is one of Italy’s unique captivating gems that is a must-see for travelers looking to immerse themselves in the Italian culture. 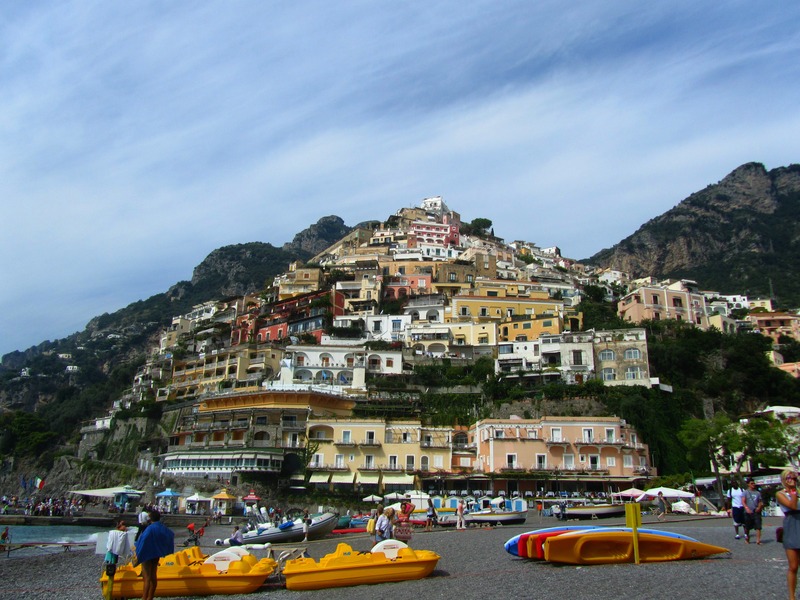 The following day we arrived at Spiaggia Grande, a beach in Positano. We were given the opportunity to sail around the coast and tour some of the city’s beautiful architecture. After traveling through the town and bussing down the massive hills, it was a welcoming contrast to view the city from afar. The colorful villas appeared to be stacked upon each other, forming a mountain-like display. We docked about 100 feet from the beach and took turns jumping off the boat’s edge and swimming to shore. 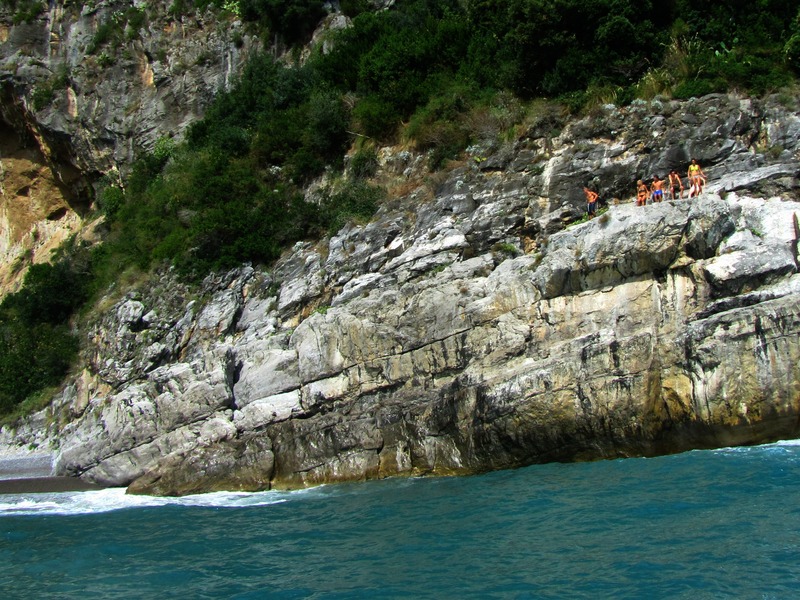 We approached a cliff and the tour guide told us that we had the option to go cliff-jumping into the Mediterranean. As I stood on the sidelines, watching my friends ascend up the cliff, I mentally wrestled with the idea – wondering if I’d have the courage to jump. Right as I was about to shy away and swim back to the boat, I thought about the keepsake I purchased just days before embarking upon my European adventure. The words “live on the edge” were engraved into a small round pendant that I vowed to take everywhere with me. As I looked back up at the cliff, I knew this was my moment. My legs were trembling by the time I reached the top of the 40 foot tall cliff. No turning back now. Before I knew it my body was hitting the water. When you’re given a once-in-a-lifetime opportunity, you take it. You embrace each moment, knowing it won’t come back again. And even if it does, it’ll never be the same. The adrenaline rush that ignites in your veins when you do something thrilling for the first time is an unmistakable feeling that’s hard to duplicate. One of the greatest joys of traveling is not only experiencing the different cultures, but becoming part of them. Engaging with the culture you are visiting is so important to maximizing your travels. It’s what helps us to create memories that can be shared and reminisced about for years to come. This excursion set the precedent on a high note for the rest of my journey and it shaped not only my semester, but my entire perspective on travel as well. Lisa Glover is the Assistant to the Corporate Communications and Brand Development departments at Conversation, a marketing agency in New York City. Her passion for travel was sparked during her semester abroad in Florence, Italy. She’s never caught without a camera in hand and she enjoys cooking and making decorative crafts. ALL PHOTOS IN THIS POST ARE COURTESY OF LISA GLOVER.